Microsoft focuses on productivity and wants you to “do more” with the Surface Windows 8 Pro tablet which will be available on February 9th. 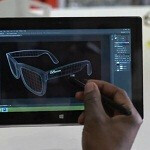 Microsoft provides a light overview of the Surface Windows 8 Pro. The form factor will be familiar to anyone that has seen or handled a Surface running Windows RT. The big differentiators between the tablets are that the Pro runs the full version of Windows 8 allowing you to run legacy applications, has an Intel i5 processor, a bit more RAM and more storage. The Pro also has a higher resolution 1920x1080 screen, bigger battery, and is a little heavier at just about 2 pounds. The Surface Pro also comes with a stylus as part of the package, using Penabled technology by Wacom which allows the Surface to ignore your hand pressing against the screen when using the stylus for writing. One thing we do not see in the video is anywhere to stow the stylus in the tablet, which may concern some folks that have a propensity to lose things. However it is a full sized instrument, like a regular pen, so it will fit in your pocket protector just fine. The Surface Windows 8 Pro can use the same Touch Cover or Type Cover, the former coming in all sorts of colors and limited edition styles, as the Surface RT. For those that have been waiting for the full Windows 8 experience in that sleek magnesium chassis, the time is coming soon. Are you going to pick up a Surface Windows 8 Pro? Is there a core i7 model ? ., and what about 3G/4G ? Looking good!! Whats my first tablet gonna be? Android.....or Surface......? Sony...make Playstation Mobile available on Surface.....cuz I dont think MS will make Xbox Arcade games available on Android....lol. I got a PS3 and a 360....I dont think I can do that for tablets. That reminds me....if Sony is aligned with Android...its also Sony vs MS for the gaming. I would rather spend a couple hundred more on a Razer Edge and get an i7 + 640m + more storage. I know that if I were to have the available funds, I would be getting the 128Gb version of the Surface Pro for my next "laptop". Seeing posts about the price....I'm scared to even ask what it is.... If its the price of a desktop PC or laptop....you can forget it. Even tho it seems to do the work of a desktop PC.....I get a whole lotta bang for my buck spending that money on a PC. The price actually doesn't seem too bad considering the ASUS Eee Slate and the Samsung Series 7 Slate were originally in the $1000-1300+ range, and those tablets seem comparable to the Surface Pro, having Wacom digitizers, SSD drives, etc. And yeah, because it's so expensive compared to other devices you can get, I wouldn't recommend getting a Surface Pro unless you're going to be doing some serious field or graphics work. But if you are, having that Penabled tablet PC is totally worth it. If you're wanting casual entertainment, get a cheap tablet. If you're wanting something for productivity on the go that's not related to design work, get a laptop. Well it's here Folks. some people got to test try it in los Vegas and said it works just fine. now there are truly 2 types of tablets on the market the store apps only General tablets like the Ipads, Android tablets, and the windows RT Tablet and the second type the more powerful Tablet PC's such as the old Windows 7 tablets and the Better Windows 8 tablets. if you are not into using standard Windows PC desktop/Laptiop/Server programs then the Ipads ,Android Tablets and the Windows surface RT is for you but if you desire to run standard Windows programs written to run on Windows 7, Vista. XP, Windows 2000. Windows NT. and some Windows 95/98 programs in compatibility mode the New Microsoft "Surface Pro" wont let you down. Lenovo makes an I7 CPU Windows 8 tablet which is more powerful , there are cheaper Windows 8 tablets on the market. My personnel opinion is to buy only buy windows 8 tablets that are run by Intel i5 or i7 CPU's or an AMD CPU that is similar in power to the Intel i5 an i7 CPU chipset because they can run Windows 8 more smoothly than Atom chips can but the Atom windows 8 tablets are cheaper! !